I am sure mew have all heard the sad mews that CLAW will be closing at the end of August. While this is furry sad, I ask all Purr Scouts to be supportive of CLAW and our Queen Midnight until the furry last day. If is was not fur CLAW, there would be no Purr Scouts! BUT I have GREAT MEWS!!!! The Purr Scouts will be continuing! YES!!! We have our own URL now and will soon start the process of moving to a new server. Queen Midnight herself has encouraged us to do this and has given us sweet mews of advice. With mewr help, we will take Purr Scouting to kitties throughout the world! ALL Purr Scouts are encouraged to stay in the new Purr Scouts and mew will keep mewr ranks and badges. We will continue to operate by the same fine standards and ideals set by CLAW, this way the spirit of CLAW will continue on, hopefully fur a long time to come! I am purroud to announce that PS Webmaster Leo Curry and Assistant PS Webmaster Bandicoot will be working hard to make this transition a smooth one, as well as to make Purr Scouts even bigger and better than efur before! Until the end of July, Purr Scouts will be awarding additional CLAW service points fur purticipation in Purr Scouts' activities! So if there are badges mew have been waiting to work on -- NOW IS THE TIME!!! And remember that the CLAW Awards Ceremony will be in August! Next month, Purr Scouts will be celebrating their TWO YEAR ANNIVERSARY! And as mew know, the Purr Scouts LOVE to party! So we will be having a HUGE Purr Scouts Second Anniversary Celebration!!! Some of the activites will included a catered picnic, a dance (with entertainment from that world-famous band, The Boyz), fireworks, and a gathering by the campfire to share our favorite Purr Scouts' memories! Several talented and hard-working Purr Scouts have formed a special committee to plan this GRAND affair! The PS Party Planning Committee includes: Buddha Gill, Buster and Sugar, Calli, Chelsea, Diamond,Fantasia,the Fox Cats, Jenny, Keekatt, the Milliken Purr Scouts,Pepe, the Poisson Purr Scouts, Puma, Rhett Kincaid Butler, Runtell, Tiger, Toby and ToOs! Let's give a BIG Purr Scouts' cheer to these dedicated Purr Scouts! Look fur PS updates about this celebration in mewr mailbox! We will soon be revealing a brand new Purr Scouts badge called "Home". With this badge, we will learn where our Purr Scouts memfurs live and all about their families! Look fur a PS Update announcing this new badge to arrive later this month! Keekatt, Kroeber Baird, Lola Poisson, Magellan,Otis, and Tiger! Keekatt, Kroeber Baird, Magellan, Otis, Toby, and ToOs! Calli, Leo Curry and ToOs! PS Calli encouraged her Meowmie to help at an animal shelter! Way to go Calli! Master Purr Scout ToOs made a web page as to why cats should not be declawed, visit his page! Visit Master Purr Scout Leo Curry's "Safe Kitty" Helping Paws Project! Don't furget to sign his guestbook to show your support for stiffer penalties for animal abusers. The guestbook will printed out and sent to U.S. Attorney General Janet Reno to bring her attention to this very important issue. 1. All new Purr Scouts start as Kit Purr Scouts as soon as they take the pledge and learn the Purr Scouts' motto. 2. After earning 3 badges, the Purr Scout shall advance to the rank of Explorer Purr Scout. 3. To become a Master Purr Scout, you must earn 10 badges and complete a Purr Scouts' Council approved community service project that benefits cats. 4. To become a Purr Scouts Leader, you must have achieved the rank of Master Purr Scout, have made a significant contribution to the Purr Scouts' program and be approved by the Purr Scouts' Council. Let's vow to continue support of this wonderfur project! We are the lucky kitties, we have homes with humans who love us. But so many kitties are not so lucky. Please keep this project in mind and save old clothing fur squares to send to the Milliken kitties. YOU can help make a shelter kitty feel a little warmer and more loved! We had a rather exceptional answer to "Describe three birds in YOUR area" of the Bird-watching badge exam that we felt was worth sharing! One of the birds in my area has the prettiest "song", it is the Bell Bird, unique to Australia this tiny bird lives high in the tree tops, making it hard to see at times, but its "song" is pure delight for it sounds like a number of beautiful tuned small bells and as each one calls the sound is like a symphony of bells. Tiny and rather "dull" in color, unless the sun catches its plummage and then it will turn into an irridescent radiance of color, this little bird lives mainly in cool forest like areas or reserves. Unfortunately it is hard to find much about this bird it is over-shadowed somewhat by the well known Kookaburra - the "laughing Jackass", this bird is much large, being about 18" and over and weighing approximately one pound. They are the largest of the Australian Kingfisher Group and are rather plain, having a cream/whitish head, brown eye stripe, back and wings, however what they lack in beauty that make up for in sound and their call is a "racuous" laughter which can be heard pre-dawn and dusk as they call to other family members. Monochromatic, they mate for life. Feeding on insects lizards, mice small birds and even snakes they use an unusual method to kill prey, they will either drop it from a height or smash it against a rock or hard substance. Their beaks are pointed and the edges are most dangerous for they are razor sharp. The botanincal name for these cheeky birds is dacelo Novaequineaa (hope my spelling is correct:). Another large Australian bird is the Sulpher Crested Cockatoo, sometimes called a "Major Mitchell", showoffs in their nature - these birds are all white with a Yellow (sulphur) crest and ear coverts, under the flight feathers and tail feathers is also a yellow color. Their diet is mainly fruits, nuts, berries flowers, roots and insect larvae, unfortunately in suburban areas they have also developed a taste for wood and will destroy anything wooden, verandahs, window sills - nothing is sacred to these birds, but despite that life would be awfully dull without them for as I said they are showoffs and will become quite tame and develop distinctive personalities. I am fortunate enought to have all three of these wonderful birds living very close, the Kookas live across the road, the Cockatoos use our house as the "fly-past" one in particular I have named Mr. Racasous, he is extremely vocal! The tiny charming Bellbirds live a short walk away and when life gets too stressful I often stroll down to the resever and lay back and let their melodic song sooth and refresh me, it is a wonderful tune to medititate too. Check out the Purr Scouts' Meowmie's Day Page! A big Purr Scouts cheer to the new Purr Scouts Birthday Card Committee -- PS Pepe, PS Sassy and PS Toby! The Purr Scout Adopt-a-Grandkitty program is temporarily closed until further notice. Please realize that there are not nearly as many volunteer Grandkitties as Purr Scouts. All requests fur a Grandkitty received prior to 4/18/00 will be honored. 1. Please do NOT send more than one e-mail, postcard or other greeting per day. Of course mew can send more if it is a birthday, holiday, or other special ocassion. Remember some older kitties are furry involved in other CLAW activities, while others may not have the energy to keep up with a younger cat. Please be considerate! 2. On the other paw, please do not be a stranger to mewr Grandkitty and e-mail at least once a week while purrticipating in the program. 3. Always show older cats the respect they deserve. Purr Scouts always mind their manners, like good kitties should! 4. If mew have grown close to mewr Grandkitty, mew can certainly keep in touch even afur mew have earned mewr badge! Have mew been to the Purr Scouts Camp yet? It's not too late to go.! It is always warm at the Purr Scouts Camp! Join us fur camping fun and maybe snuggle up close to the fire and listen to Purr Scouts' ghost stories! The Purr Scouts are now ofur 200 kitties strong! PLEASE sign all e-meows with mewr name as there are too many Purr Scouts to recognize mew by e-meow address alone! This is furry important as we award CLAW service points every time you purrticipate in a Purr Scouts activity! The address you use fur Purr Scouts should be the same address you use fur other CLAW activites. We send out updates and invitations from time to time and we dont want you to miss out on all the excitement! Meow! Several Purr Scouts have NOT received their badges because of wrong or no longer current e-meow addresses! 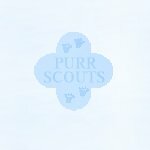 Do mew have a Purr Scouts webpage displaying mewr Purr Scout accomplishments? Then send us mewr name and URL to be added to the list of PS Webpages! Mew! Mew! Mew! -- the long awaited Purr Scout Mystery Book! Compiled from all the Purr Scout mystery stories submitted fur the PS Mystery badge! If mew didn't submit mewr mystery story to earn the badge, you still can! Just paw on over to the PS Headquarters and click on the PS Mystery badge to find out how! The Purr Scout Mystery book is in the CLAW library or you can click on the link below. The Purr Scout Store at the CLAW MAll -- Purr Scouts' Practical Solutions-- has a new Assistant PS Store Manager -- Leo Curry to aid PS Store Manager Squeaky Fromm. We are looking fur art supplies, holiday items, etc...to add to the store inventory. I saw the dish bottom look back. See? Come and see if I'm telling the truth! Oh. this has upset me severely! But I can see dish-bottom clearly! What if I finished this part and that part? It would all be dish-bottom! I'd die! How can you cruelly ignore my complaint? The kibble was low, and you knew it! While I can see dish-bottom through it! The state of my dish is so serious! On the dish bottom, do as I wish! So I'll eat from the other cat's dish. Concatulations to all Purr Scouts' humans graduationg from high school or college! SOMEDAY mew may even be almost as wise as the kitties ruling mewr home!